I've posted this elsewhere on social media, so apologies if it's been shown before. 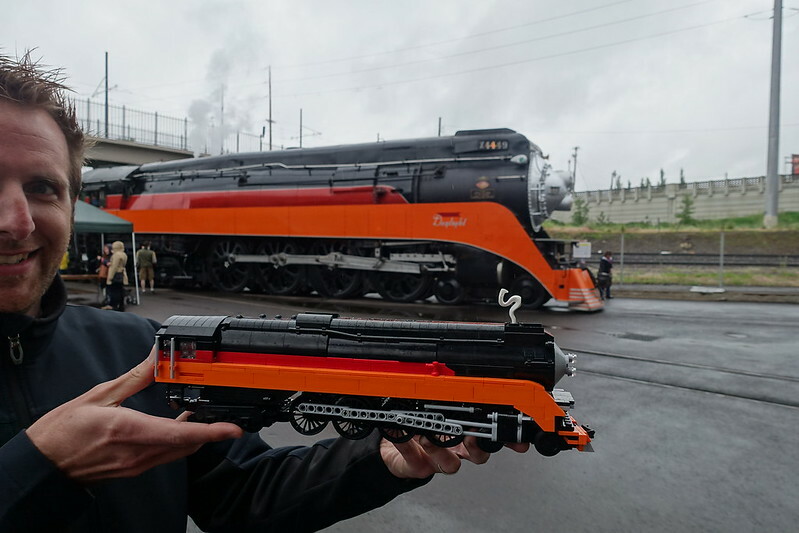 Here's me with my copy of Tony Sava's SP 4449, alongside the real locomotive in Portland, OR. 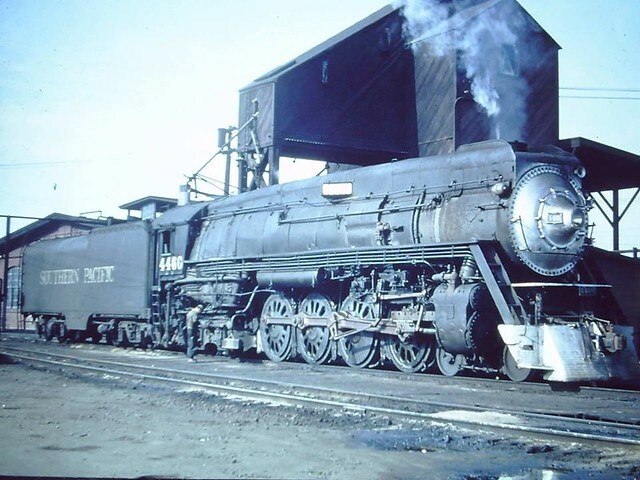 The SP 4449 recently completed its federally mandated 15 year boiler inspection and remains in permanent display at the Oregon Rail Heritage Foundation. Aside from Thomas the Tank Engine , the SP 4449 may be the most photographed locomotive in the world. She is arguably one of the most beautiful locomotives ever built, and kept that way by the all-volunteer Friends of SP 4449. Many thanks to Mr. Sava for making these instructions available - and as you can see for yourself, his rendition is nearly perfectly proportioned to the real-life locomotive. Next on the docket for me will be to complete some 8w coaches to go along with her. Yup, that looks like the Pacific Northwest. Well, everywhere except where I live... in a rain shadow. Have you considered upgrading to non-Lego custom drivers and rods? The body of the model itself is superb (love the nose; love the cab; you nailed the colors), but the wheels kind of rob the whole thing of some of its majesty. I'd love to see your take on a GS-6 Warbaby - IMO the better looking of the GS designs. The drivers are BBB (non-LEGO drivers); I've thought of upgrading the rods, but I kinda like the Technic beam rods as they are. This is not my design, but rather that of Tony Sava (Sava Railroad Works on Bricklink). This model could definitely be updated to a 4460. I've thought about even redoing the livery in the Freedom Train colors. It's my own version, and I'm sorry if I hijacked the thread. Anyway, the model in the OP looks spot on to a GS-4, so good job sava at designing such a remarkable engine and congrats to ritzcrackerman for getting both real loco and LEGO copycat in a single shot!! Good to see Daylight refurbished. We were in Portland last year and saw the Daylight ripped down, got to look inside the firebox, etc. Yeah I was there in 2013 and saw it torn apart for the 15 year inspection. Congratulations on a sweet looking build. We here in Portland are indeed blessed... Not only do do we have the 4449, but also two other fully restored steam locomotives that are housed at our rail museum. If you are lucky enough to be here around Christmas time, you have a 50/50 shot at getting to ride on a "Holiday Train" that is pulled by the 4449. Truely a treat that is not to be missed. (All proceeds go to the Friends of the 4449). If you would like to really make your model POP, I would suggest contacting Zephyr1934 about obtaining some 4449 Daylight stickers. He produces an amazing product. (I hope I have not violated any rules of this forum.) Good work!